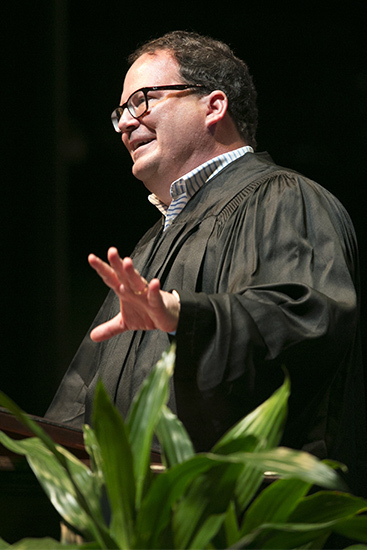 Educator and media executive Micheal Flaherty told May graduates of Samford University’s School of the Arts and Orlean Bullard Beeson School of Education to disregard cynics and skeptics who may put down their career choice. “Our Lord and Savior was an artist for the first 30 years of his life, and then became a rabbi and teacher for the final three. You’ve chosen a career that will have more impact than any other,” Flaherty said during the commencement program on Saturday, May 16. Flaherty, a former teacher in Boston, Massachusetts, schools, told how he came to co-found Walden Media in 1999. The company is known for encouraging curiosity and imagination through the development of family films and literature. His students’ keen interest in the popular film Titanic, he said, helped him understand the power that television and films have to initiate reading and question-asking. “I saw that education was missing the ability to ask those great questions, so why not combine art and education together,” he said. At the same time his students were fascinated by Titanic, the youths who would kill school students in Littleton, Colorado, were watching the more violent 1995 film, Basketball Diaries. “I realized the impact media has on our culture,” he said, recalling that a shooter killed a teen girl after she acknowledged that she believed in God. Combining his love for teaching and his newfound faith, Flaherty set out to make films with a good story that were different from what influenced the Columbine shooters. After initially consulting his schoolteacher wife’s student reading list, he began the company that has now produced and financed more than 50 films, including The Chronicles of Narnia, Charlotte’s Web, Because of Winn Dixie and the acclaimed education-reform films Waiting for Superman and Won’t Back Down that together have grossed more than $3 billion at the global box office. “I saw how profound the imagination of children can be,” said Flaherty, who said he loves the idea of people, including the Christians in the commencement auditorium, believing in something they can’t see. “Children show us that the most important things are the ones we cannot see,” said Flaherty, who most recently cofounded The Good Thief Films production company. Flaherty told how hymn writer John Newton wrote “Amazing Grace,” after spending much of his life as an infidel and slave trader. “God’s story is one of redemption,” Flaherty said before asking the audience to sing, a cappella, a stanza of the familiar hymn. Rachel Katharine Cason received the Velma Wright Irons award, the salutatorian honor, for having the second highest grade average across all university schools. She is an education major from Opelika, Alabama. Moya Nordlund, longtime music professor and chair of academic studies in the School of the Arts Division of Music, was recognized as retiring this year after more than 20 years on the faculty.